Cut Cardstock 10” x 7”, score at 5” to create a 5” x 7” card base. Cut Maroon cardstock 4 7/8” x 6 7/8” and adhere to the card base using dries clear adhesive. Cut another piece of white cardstock 4 3/4” x 6 3/4”, emboss with embossing folder and adhere to card base. Stamp sentiment on white cardstock with Dark Peony ink and diecut using one of the plain edge heart dies. Cut a larger eyelet heart from purple punch cardstock and adhere the hearts together with dimensional dots. Add to the card base with more dimensional dots. 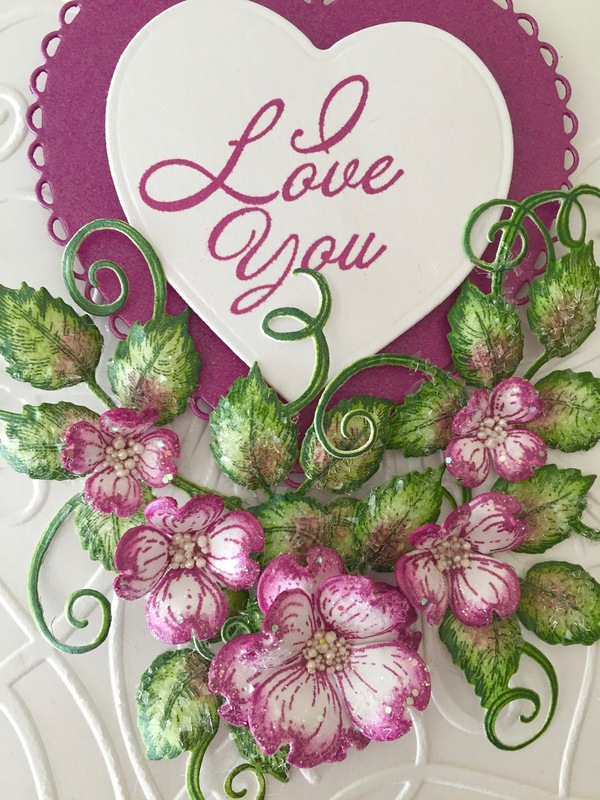 Stamp the flowering dogwoods on white cardstock using dark peony ink, diecut with coordinating die, add more color to the edges and shape with the deluxe flower shaping kit. Add Minnie Pearl Prills to the centers, sponge with dries clear adhesive and sprinkle with Crystal Clear. Stamp the classic rose vines on white cardstock with Bamboo Leaves Ink, cut with coordinating die, lightly color the centers with bamboo leaves and dark peony inks and add more color to the edges. Shape with deluxe flower shaping kit, add Crystal Clear and adhere the vines and the flowers to the card base as shown. Thank you so much for stopping by...I love to read your comments! Thank you so much Glenda! I liked the colors too! Wow! Janet this is just stunning! I love how the purple pops off that embossed whit background! So elegant! Thank you so much Kathy! I’m loving that paper myself, it goes beautifully with the ink! I got that cardstock in a sample pack and I need to order more! Beautiful, I love your dogwood! 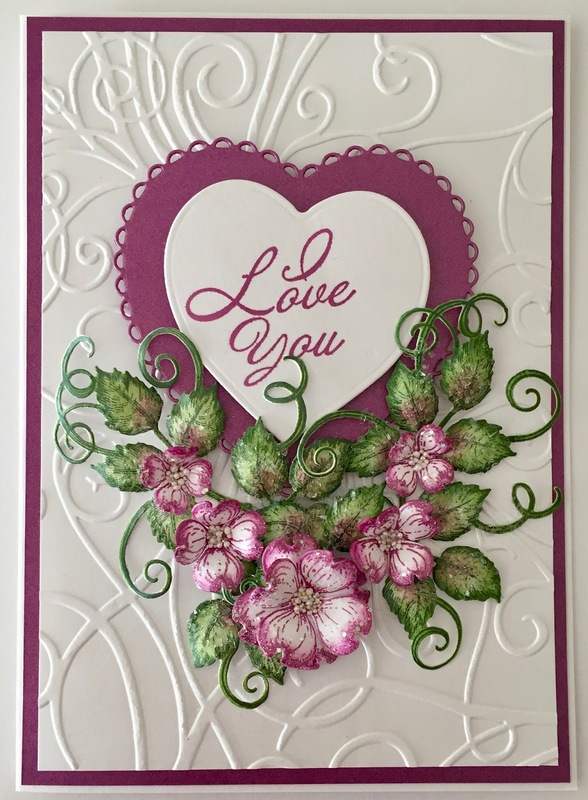 Your heart and I love you is perfect with them and your wonderful embossing! Your card is beautiful. I love the simplicity. I have all of the items to make this card except the Sheena Douglas embossing folder. Can you tell me where you ordered the embossing folder, and how long ago? I cannot find this folder. I like that this folder is nice for the background look. Hi Jane...thank you so much for your lovely comment. Unfortunately I used an old embossing folder that was given to me as a gift when I first started paper crafting. I checked around to see if I could find it for you but I can't. There are so many beautiful embossing folders currently available that would look lovely with this design. I hope you find one that works for you. Happy Crafting!